Outdoor Research makes a strong debut in the technical Alpine outerwear category with the Igneo pant, a sidecountry-oriented hard shell. The Igneo is made of Pertex's waterproof/breathable Shield fabric. It has a nice, middle-ground texture and feel: not too stiff, not too soft. The pant is lightly insulated in the seat and knees. In practice, you won't notice the insulation—it's very sheer. You will appreciate the extra warmth, however, as these are the first places to get cold on chilly chairlift days. Outdoor Research has added a few features that may well be called innovative. Seemingly minor but actually very much appreciated is the placement of the cargo pockets on the outsides of the thighs. Pocket placement here is just right, allowing your heavier/bulkier items like cameras, sunglasses, and cell phones to nestle in the nook just outside your quad muscles, where you'll forget they're there. Also notable is the inclusion of zippered inner-thigh vents. Similar to pit zips on jackets, these are placed on the inside of your thighs, as opposed to the outside. When open, they deliver a bracing breeze right to the...uh...frontal crotch region. There may be a bit of theory to support this kind of ventilation, as the thigh vents deliver cool air right to your femoral arteries, as well as to other blood-rich parts and places we're all familiar with. How does the venting compare to traditional full-length side zips? It's not nearly as effective, but it is targeted, and it also comes with the considerable benefit of keeping the bulk of the pant closed to blowing/falling snow. In addition to the thigh vents, we also get mesh gaiters inside the boot cuffs to add extra ventilation to the lower legs, and set up a cross-breeze. As with North Face's Freedom pant, I'm just not a big fan of this feature for an inbounds ski pant. I don't like being forced to accept an always-open vent around my calves—especially when it's bitter cold. That said, the mesh gaiters do improve ventilation in conjunction with the thigh vents, and the mesh is likely fine enough to be impenetrable to snow. There are no expansion tabs on the waist to customize the fit, and also no elastic, so if you find the pants slipping down your hips, you'll need to wear a belt (not included) via Igneo's belt loops. In a pant that is otherwise so carefully designed, this is a puzzling omission to me. On the whole I find the Igneo pant handsomely styled, flawlessly tailored, and meticulously built. 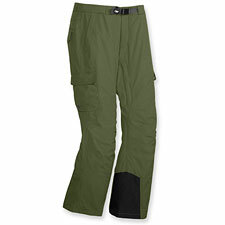 They look and feel expensive (though they're perhaps not quite in the economy price class), and for the sidecountry niche, in which skiers and snowboarders will predominantly be riding chairlifts but also doing some occasional hiking and skinning, the pant is well-conceived and executed—a very solid choice for cool to coldish weather.